Winger Subaru is set to supply the engines to drive the Chiefs forward this season, with its Hamilton dealership becoming the club’s official vehicle supplier. The three-year deal kicks off this month and will see the Chiefs supplied with 12 of Subaru’s most popular model – the Outback SUV. As Hamilton is the home to the Chiefs Rugby Club, one of the five New Zealand franchises in the Investec Super Rugby competition, the local partnership is a natural fit for Winger Subaru Hamilton. 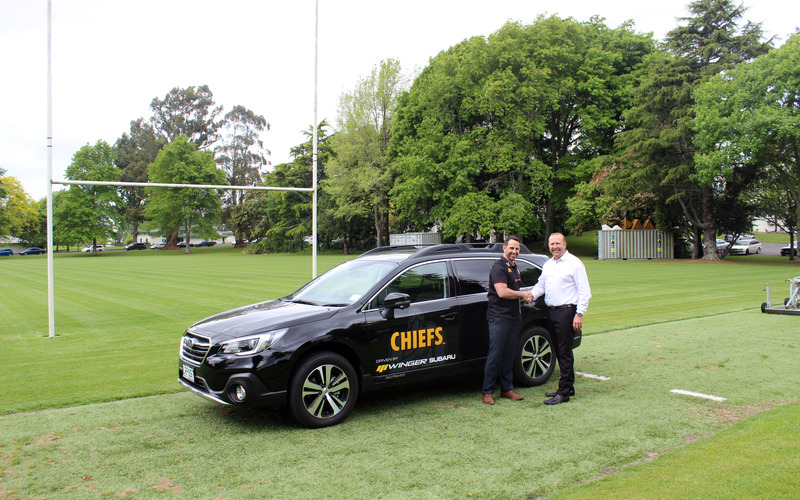 A proud Chiefs supporter, Winger Subaru Hamilton Dealer Principal Paul Burborough says the dealership is delighted to be involved with this high-profile rugby club. The Chiefs’ region is made up of the provincial unions of Counties Manukau, Bay of Plenty, Thames Valley, Waikato, King Country and Taranaki, with one in every four New Zealanders residing within the Chiefs boundaries. The club’s Super Rugby side, the Gallagher Chiefs have won two Super Rugby championships and have played in the Super Rugby playoffs in each year since the first title was won in 2012. “We are therefore excited to be able to welcome Winger Subaru into our whanau of sponsors. We are looking forward to a partnership that is aligned, collaborative and mutually beneficial for both organisations. On behalf of the Chiefs board; staff and players; members and fans, we thank the team at Winger Subaru for their commitment and support to the club and to the Gallagher Chiefs,” Mr Austin adds. With a history of customer satisfaction that dates back to 1931, Winger Motors is one of New Zealand’s most significant automotive dealership networks. Winger Subaru owner Wayne Leach says it is a pleasure to be able to harness the network’s success to help drive forward organisations like the Chiefs.